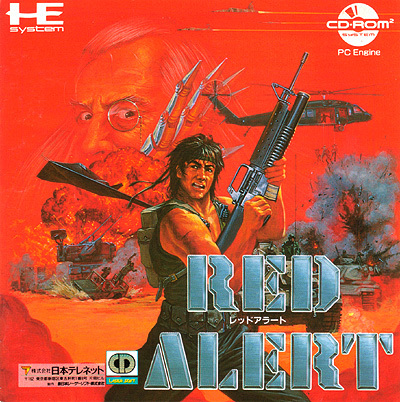 Overhead run-and-shoot game with a Rambo-esque lead character called Guy Kazama. Last Alert is an overhead run and gun, similar to Bloody Wolf, or perhaps more appropriately, an updated Commando, in the vein of Mercs. The first thing you'll need to know is that the English dub is apparently HILARIOUS. This game is really not bad at all, if you enjoy this type of game (I do). The stages are very non-linear and feature hidden areas and secondary objectives, and you can pick up plenty of special weapons like flamethrowers to help your one-man army cut through an ACTUAL army. This type of game has been done better elsewhere, but in isolation, this game is really not bad, and it gets extra credit for excellent (minimally animated) cut scenes that help drive the narrative along. Definitely worth a try.